Your Dashboard is a live updating, real-time snapshot of your federal contracting (and grant-making) activity. It provides you immediate insight into what you and your team are working on right now, as well as higher-level understanding of your company's active contracts and performance history. Here is a short video walkthrough demonstrating how to customize, interact with, and interpret your dashboards, A written article with screenshots is below. Step 1 - Who do you work for? In order for GovTribe to help you to better understand your world, we need to know your company or organization. Most of the time, we're able to determine this automatically using your email domain. In the event we can't pre-set you company, you can customize your dashboard further by doing so. If there is a button in the top left of your Dashboard that says Select My Company that indicates GovTribe was not able to determine your company for you. To add your company, click the button and then start typing the name of your company. Recommendations will start appearing as you type. Select your company when you see it. Once you've selected your company (or we've figured it out automatically,) the Dashboard will come alive. The first three boxes are based on content you've created in GovTribe. The last three boxes are based on public data about your company. 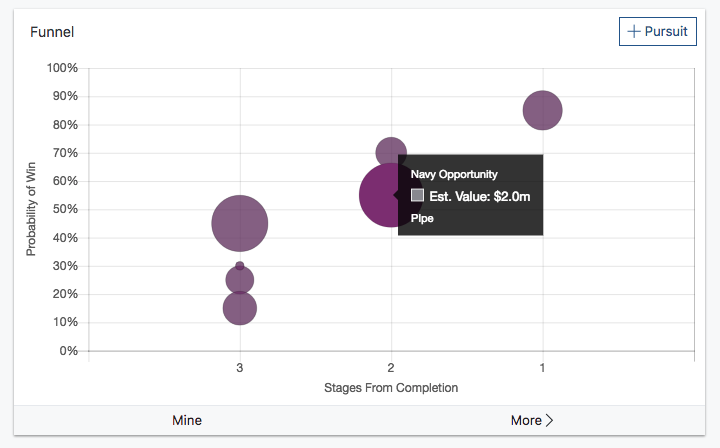 The Funnel chart shows you the value, probability of win, and stage of all active Pursuits across your Account. 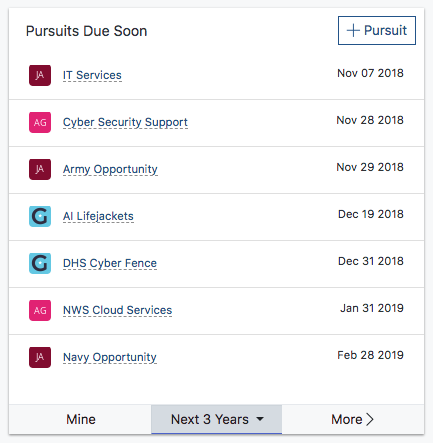 You can quickly add a Pursuit, filter to Pursuits that are assigned to you, or click "More" to see a listing of all Pursuits. The Tasks Due Soon box shows you all Tasks across your Account that are due soon, along with the owner of the Task. You can quickly Add a Task using the + Task button in the upper right corner. 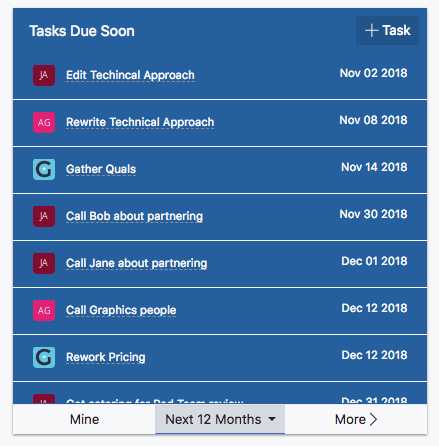 You can filter to just the Tasks that are assigned to you by clicking on Mine. And you can change the timeframe using the dropdown menu in the bottom center of the Tasks box. Clicking on More > will take you to the main Tasks search page. The Pursuits Due Soon box shows you all of the Pursuits across your Account that are due soon, as well as the owner. You can quickly Add a Pursuit, filter to just Pursuits that are assigned to you, and change the timeframe. The Contracts Ending Soon box shows you all of the Federal Contract Awards for your company that are ending within the selected timeframe. This is a great way to start filling up your Pipelines with recompetes! 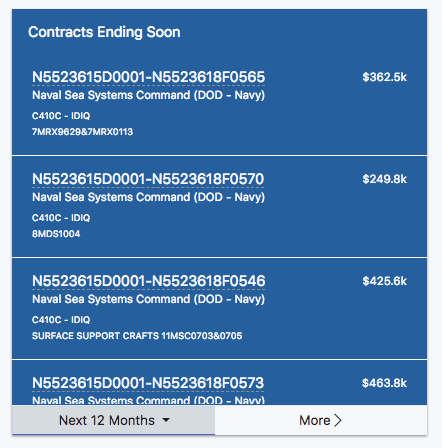 You can quickly change the timeframe or click through to see all Federal Contract Awards for your company. 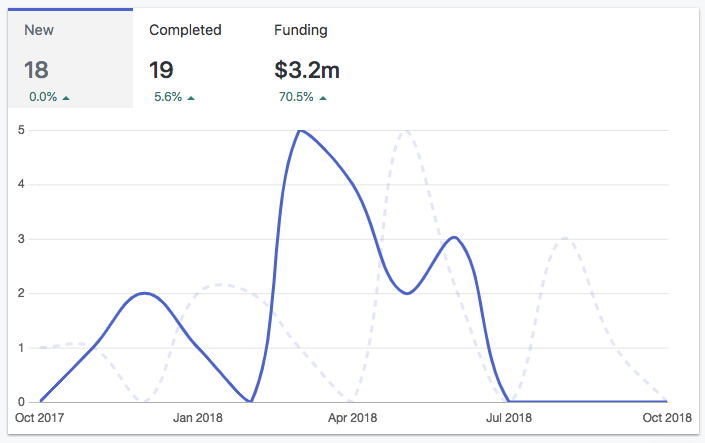 The Funding By Agency box shows the breakdown of funding by Federal Agency for your company, during the selected timeframe. New Awards - The total number of new Federal Contract Awards for your company in the past year. Completed Awards - The total number of completed Federal Contract Awards for your company in the past year. 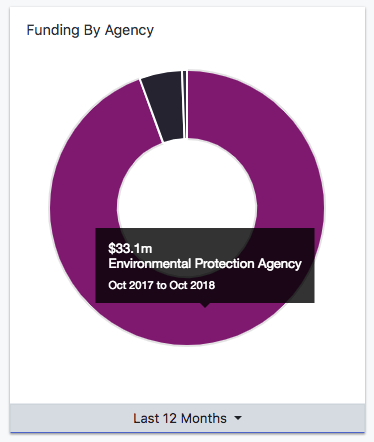 Funding - The total amount of obligations your company received in the past year.